Swimming Australia is the peak governing body for competitive swimming in Australia. The body has approximately 100,000 registered members nationally in 1100 clubs across the country, which includes swimmers, coaches, officials, administrators and volunteers. The body oversees the management and development of the sport from the national team at the elite level, the conduct of national and international events, through to grass roots participation. The organisation's vision is to become Australia's leading sport through increased participation, continual outstanding performance and commercial excellence. Appearance Koalas have brownish-grey or silver-grey fur, and a big pink and/or black nose. They have sharp claws which help them to climb. Koalas also have finger prints which look the same as human finger prints. Finger print experts have had difficulty in being able to tell if the prints are from a human or koala. Finger prints are rare among mammals that climb trees. Scientists do not know why the koala has them, but their best guess is that it helpsthe koala select leaves to eat. Koalas are mostly active at night. They live in trees and are rarely found on the ground. Koalas have two unusual characteristics. 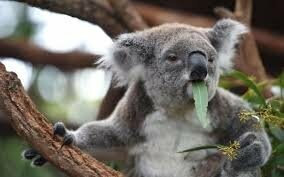 They eat leaves of eucalyptus trees . Koalas do not drink often, they get most of their water from the eucalyptus leaves they eat. Eucalyptus leaves are poisonous, but koalas do not get poisoned. This is because they have certain bacteria in their digestive tract that can detoxify the poison in the leaves. Koalas, however, have to sleep long hours because eucalyptus leaves do not produce much energy and also because the digestive process takes a long time and consumes lots of energy. Second, koalas have a peculiar way of cooling themselves. Unlike humans who sweat and other animals, which either pant or lick their fur to stay cool, koalas reduce their body heat by hugging a tree. The temperature of the trunks of certain trees is up to 9 degrees Celsius lower than the air temperature. Koalas prefer to stay on these trees on a hot day even if they do not have the tastiest leaves. Koalas live alone most of the time, but they have a social hierarchywith the other koalas who live near. After a pregnancy of 35 days, the newly born koala is about a quarter of an inch long, and is born with no ears, eyes, or hair. It crawls into its mothers pouch on its own. After 12 months the young koala is old enough that it does not go into its mother's pouch or need milk anymore. The female koala can have another baby then. Young koalas usually leave their mothers when they are 18 months old, but if their mother does not have another baby they sometimes stay for up to three years. Koalas become mature when they are about two years old, but they often have their first baby after another two years. 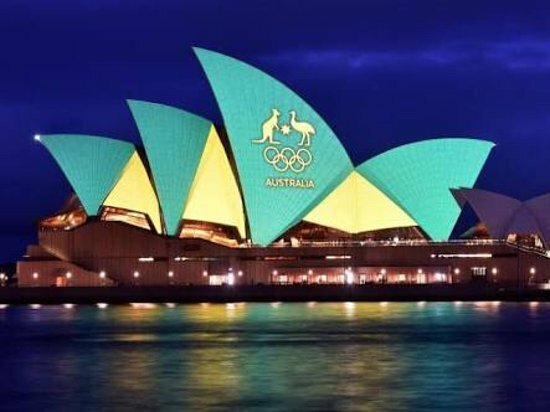 The Sydney Opera House is an opera house of an iconic building on the shores of Sydney Harbour, in Sydney, Australia. It is shaped like the sails of a boat. Many concerts and events take place here, with 200 performances a year presented by Opera Australia, Australia's national opera company.It is a famous tourist attraction. The Sydney Opera House is out in the ocean. It is like a peninsula. The land where the Sydney Opera House stands is called Bennelong Point. Bennelong Point was once home to Fort Macquarie (the fort was built in 1817 and knocked down in 1901). On 10 August 1902, the Fort Macquarie Tram Depot was opened at Bennelong Point. The depot was knocked down in 1958. The Sydney Opera House was built on the same spot and the work began in 1959. It was designed by Danish architect Jorn Utzon. He won a design competition in 1957. Utzon left the project in February 1966 because the government was not paying his invoices. The building finally opened on 20 October in 1973. The project was completed ten years later and cost more than fourteen times the original budget. In 2001, Utzon was invited back to restore the building and change it back towards his original designs. 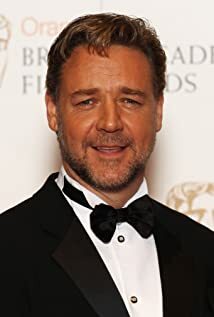 Russell Ira Crowe was born in Wellington, New Zealand, to Jocelyn Yvonne (Wemyss) and John Alexander Crowe, both of whom catered movie sets. His maternal grandfather, Stanley Wemyss, was a cinematographer. Crowe's recent ancestry includes Welsh (where his paternal grandfather was born, in Wrexham), English, Irish, Scottish, Norwegian, Swedish, and Maori (one of Crowe's maternal great-grandmothers, Erana Putiputi Hayes Heihi, was Maori). Crowe's family moved to Australia when he was a small child, and Russell got the acting bug early in life. Beginning as a child star on a local Australian TV show, Russell's first big break came with two films ... the first, Romper Stomper (1992), gained him a name throughout the film community in Australia and the neighboring countries. The second, The Sum of Us (1994), helped put him on the American map, so to speak. Sharon Stone heard of him from Romper Stomper (1992) and wanted him for her film, Mort ou vif (1995). But filming on The Sum of Us(1994) had already begun. Sharon is reported to have held up shooting until she had her gunslinger-Crowe, for her film. With Mort ou vif (1995) under his belt as his first American film, the second was offered to him soon after. Programme pour tuer (1995), starring Denzel Washington, put Russell in the body of a Virtual Serial Killer, Sid6.7 ... a role unlike any he had played so far. Programme pour tuer (1995), a Sci-Fi extravaganza, was a fun film and, again, opened the door to even more American offers. L.A.Confidential(1997), Russell's third American film, brought him the US fame and attention that his fans have felt he deserved all along. Missing the Oscar nod this time around, he didn't seem deterred and signed to do his first film with The Walt Disney Company, Mystery, Alaska (1999). He achieved even more success and awards for his performances in Gladiator (2000) and Un homme d'exeption (2001).